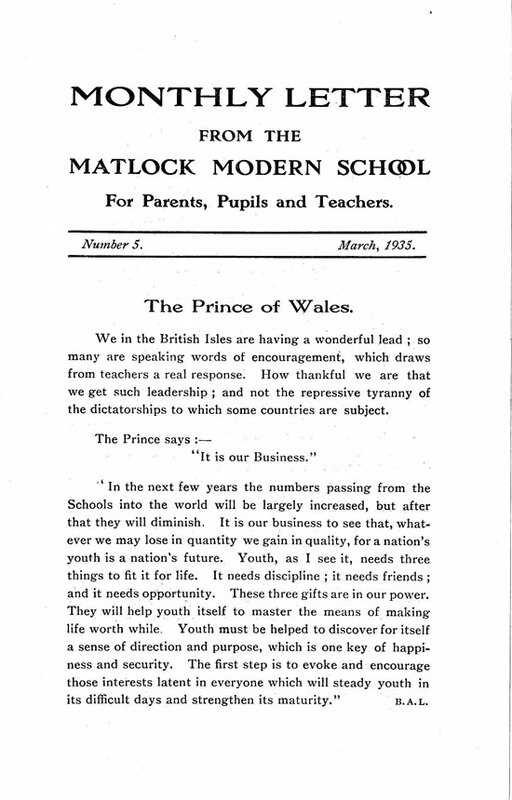 Matlock Modern School's four page "Monthly Letter" of March 1935, for the parents, pupils and staff, shows us that the pupils were encouraged to take part in a wide variety of social, artistic, academic and horticultural activities, both within the school and in the town. 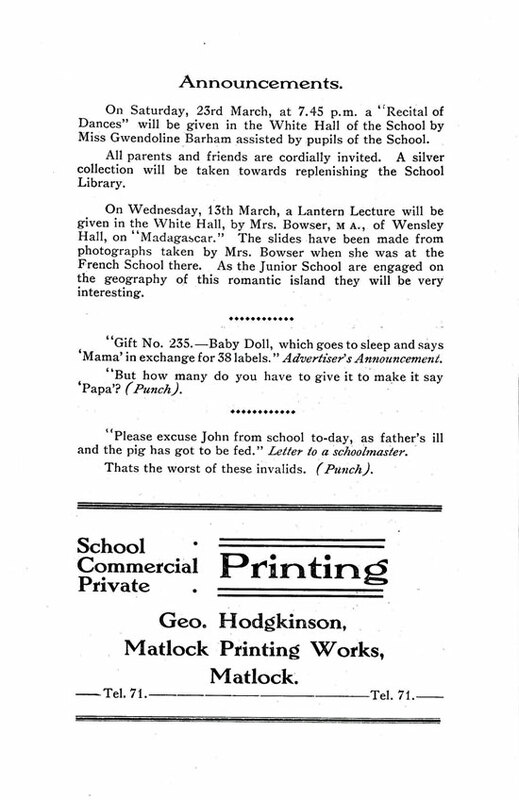 The school was very progressive for the times and this bulletin is rather charming; a very pleasant, humorous atmosphere seems to spring from the pages. 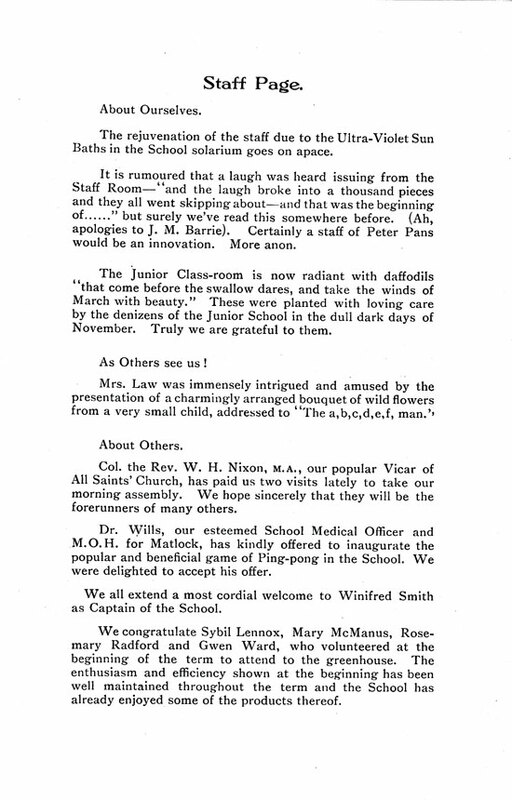 The announcement that a school council had just been formed, made up of some pupils, was very forward thinking for the 1930s (see page 2 below). 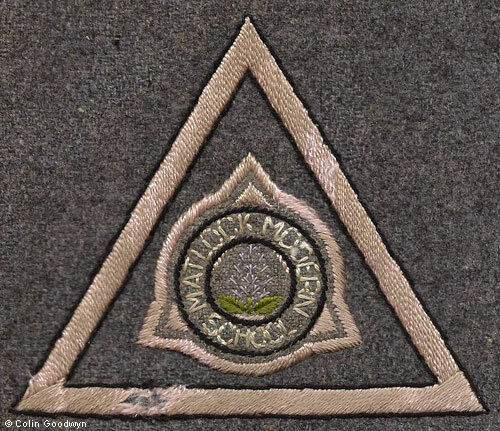 The school was originally called Matlock Garden School and had moved from Matlock Dale in 1926 which is when it changed its name. It was housed in a former hydro building on Rutland Street, originally Matlock House Hydro (later Tilley's Hydro). There is a reference to the school's Ultra-violet sun bath in the solarium, presumably left over from the building's former days as a hydro, on page 3 below. Mr. and Mrs Law moved to Rutland Street with the school and the offices of Albert Law's accountancy firm, Keens, Shay, Law and Co., were also on the premises. Bertha Alice Law, the school's principal, was born at Great Langton, Northallerton, Yorkshire; she married her husband Albert there in late 1911. Albert was a chartered accountant by profession, as well as the auditor and secretary of Walsall Chamber of Commerce. Shortly before her marriage Bertha Law was recorded as being an artist in the census, which is probably why arts and crafts were amongst the school's many strengths. Pupils would return to Tor Cottage, where the school was founded, as a large studio still remained there. Although nothing is mentioned in the newsletter, there were holiday activities and "camps" at the school. For example, in 1927 the Federation of University Women's "Camps" for schoolgirls ran senior camps, for those who had left school but were not yet 23, and one was opened at Matlock Garden School during the summer holidays, so presumably at Tor Cottage rather than the Rutland Street building. The school was to close in 1936. This embroidered badge, which is on a blazer, might be unique. as the uniform was grey and lilac. Only a hint of the original colour has survived. 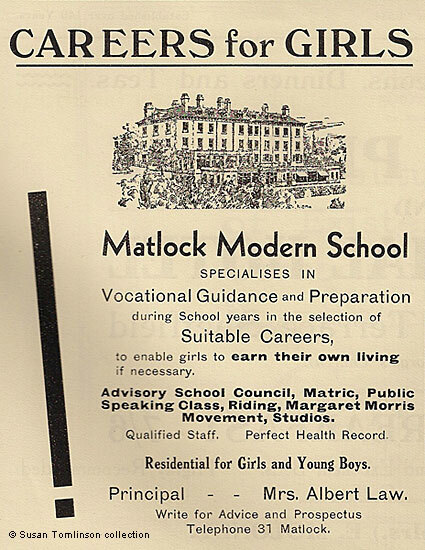 1934 advertisement for Matlock Modern School, published in "Derbyshire Countryside"
Newsletter in the collection of and kindly provided by Robin Yates, whose mother was Mary Anthony. School badge © Colin Goodwyn collection. "Derbyshire Countryside" advertisement © Susan Tomlinson collection. Goodwyn, Colin (1998) "The History of Tor Cottage Matlock Dale", a privately published limited edition. 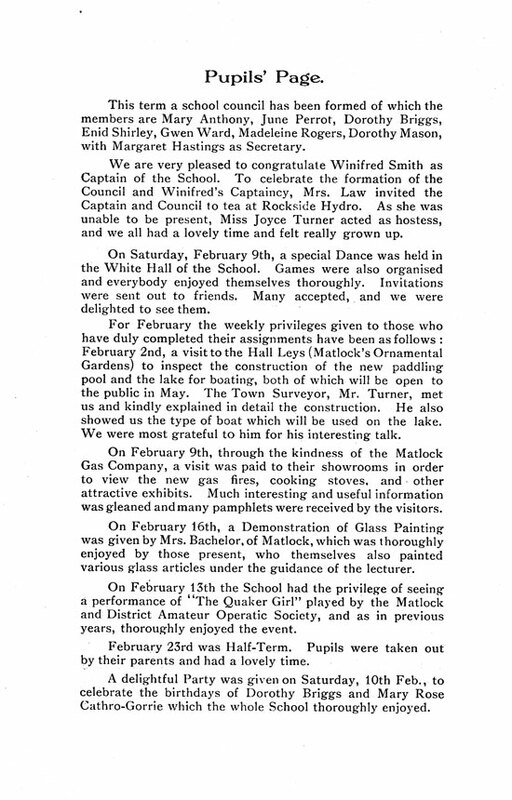 Mrs. Law also used Tor House, then known as Matlock Garden School. Mrs. Law was born in Great Langton in 1882, one of the daughters of Thomas and Hannah Place, who were both from Staffordshire. Thomas Place was a Timber Merchant. Albert Law was born in 1879, in Tipton, the second son of Edward and Sarah Law. It is possible the families might have known or known of each other as Bertha's mother was also born in Tipton. By 1891 Albert Law was an Accountants Clerk and living with his family in Walsall (extracted from the 1891 census). Albert died in Yorkshire in 1957, aged 88. Bertha outlived her husband, and died in Scarborough in 1966, aged 84. The 1911 census is available on Find My Past (an external link, so with open in a new tab or window). Camps For Schoolgirls, "The Times", Tuesday, 2 Aug, 1927. These were held at boarding schools and most catered for girls who were actually at school rather than young women. It is strange it was still Matlock Garden School in the article, but perhaps the newpaper's information was out of date. The 1939 Register shows the Law family, including their daughter Jeanne, living in Allenton. Mrs. Law was not working.